Lady Jane Grey was born in London in the late 1536/1537 she was the daughter of Henry Grey, 1st Duke of Suffolk, and his wife, Lady Frances Brandon. 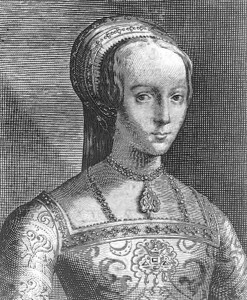 Lady Frances was the daughter of Mary Tudor, Queen of France and the younger sister of Henry VIII. Jane had two sisters, Catherine Grey and Mary Grey. By their mother, the three sisters were great-granddaughters of Henry VII, grandnieces of Henry VIII, and first cousins once removed of Edward VI. Jane received a Great education, studying Latin, Greek and Hebrew. Through the influence of her father and her tutors, she became a committed Protestant. Lady Jane went on to marry Lord Guilford Dudley. On 9 July Jane was Made queen Of England by her cousin Edward VI on his death bed, although she was reluctant Jane accepted her fate. But Mary I was proclaimed queen in London on 19 July and Jane was put in the tower. Jane however was speared a traitors death until Thomas Wyatt the younger a known protestant made a rebellion against Mary I to place a protestant Jane back on the Throne, giving Mary no choice but to have Jane removed to stop the riots. On the morning of 12 February 1554 Lady Jane Grey along with her Husband was executed on Tower Hill. She is known as The Nine days Queen. A young smart respectful woman who was both kind and forgiving. I don’t believe her to be weak like some say or a scared little girl…maybe at the end but anyone would be. Jane had to of been tough to a degree to put up with her family and others around her. Everything that happened to her was because of someone else and I think it’s a shame she had no freedom, for I would think she could have been as respected as Catharine of Aragon if she had been given a chance. She was an unwilling pawn (like many) in her families’ game of thrones, which in the end took her life. That’s why I’m interested In Jane… because there is so much we will never know about her because she wasn’t around long enough. I think I would have liked to have seen her as a Queen…how would she have been? I would like to believe she would have gained enough power to be able to brake free of her demons and rule England with a firm yet gentle fist. Queen Jane of peaceful England. Although she is seen as a tragedy she was a lady of true grace and at such a young age showing only a small amount of fear in the end that I admire her for all she was and pity for all she never got to be.